Feb. 3, 2017 | 12:05 a.m.
Syrian refugees Rula and Abdul shop at Istanbul Market in Madison on Jan. 31, 2017. They asked that their last names not be used for their own safety. Rula and Abdul plied the narrow aisles of Madison's Istanbul Market on Tuesday, looking for spices and other staples, such as dried jute leaves, that are hard to find in their new country. The Syrian couple arrived in Wisconsin's capital city with their daughters, ages 5 and 8, on Jan. 20, the day President Donald Trump was sworn into office. A week later, Trump issued an executive order indefinitely barring Syrian refugees such as Rula and Abdul and temporarily blocking citizens from seven Muslim-majority countries from entering the United States, at least until new "extreme vetting" rules can be written. The goal, the president said, is to keep "radical Islamic terrorists" out of America. The order is being challenged in several courts; critics charge it unfairly targets refugees. Alex Nowrasteh of the libertarian Cato Institute found that between 1975 and the end of 2015, "20 refugees have been convicted of attempting or committing terrorism on U.S. soil, and only three Americans have been killed in attacks committed by refugees — all in the 1970s. Zero Americans have been killed by Syrian refugees in a terrorist attack on U.S. soil." In Wisconsin, Trump's immigration order and earlier executive actions calling for local police to help with immigration enforcement and threatening to strip federal funding from states and cities that harbor undocumented immigrants are creating fear, uncertainty — and pushback. Madison Mayor Paul Soglin has declared that while city police will honor federal requests to detain serious criminals, "We will not use our local police department as a tool to enforce federal immigration laws." Dane County Sheriff Dave Mahoney made a similar vow. Addressing more than 2,000 people at an immigration forum in Madison on Sunday, Mahoney said he answered "Hell no" when asked by an agent from U.S. Immigration and Customs Enforcement whether he would allow his officers to be deputized as federal immigration agents. Gov. Scott Walker vowed in 2015 that Wisconsin would not accept Syrian refugees after terrorists who had traveled to and from Syria killed 120 people in Paris. The governor later acknowledged he has no legal authority to block their entrance, although Trump's latest executive order calls for possibly giving states and local governments more control over immigration. "State refugee programs have no role in this process; it is entirely a federal process and is funded 100 percent with federal dollars," he said. The agency estimates Wisconsin has taken in 75,000 people from 50 countries since the 1970s when the first wave of refugees came — Hmong people from Laos, tens of thousands of whom died helping the United States in the Vietnam War and the "secret war" in Laos. Rula and Abdul's resettlement was the culmination of a four-year quest. Rula, an elementary teacher, and Abdul, a chef, left their homeland in 2012, joining millions of Syrians fleeing a brutal five-year civil war in which an estimated 400,000 people have been killed. They asked that their last names not be used for their own safety. Syrian refugees Rula and Abdul arrived in Madison on Jan. 20, 2017, with their daughters, ages 5 and 8. A week later, President Donald Trump halted any additional arrivals of refugees from the war-torn country indefinitely. They were photographed Jan. 31, 2017 in Madison. "She was just counting minute by minute to leave the country and come either to the USA, Norway or Canada," said Rihab Taha, a caseworker for Jewish Social Services who translated for the Syrian couple during their recent shopping trip. Once refugees arrive in Wisconsin, local agencies, including Jewish Social Services, Lutheran Social Services, Catholic Charities and others help to line up services such as temporary cash assistance, housing, health care, enrollment in school and participation in Wisconsin's welfare-to-work program, W-2. Becca Schwartz, resettlement coordinator for Jewish Social Services, said she is helping three Syrian families in Madison, including Rula and Abdul’s family. Resettlement of two more Syrian families and a group from Eritrea are now on hold, she said. In Sheboygan, a family of nine scheduled for resettlement by a different agency has been blocked by Trump's ban on Syrian refugees. 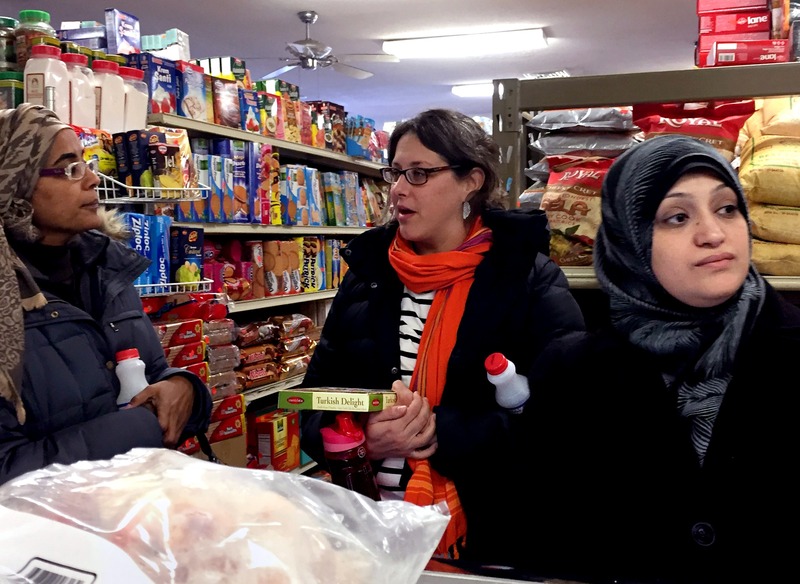 Rihab Taha, left, a caseworker for Jewish Social Services who came as an immigrant from Sudan; Becca Schwartz, center, resettlement coordinator for JSS; and Rula, right, a newly arrived refugee from Syria, shop at Istanbul Market in Madison on Jan. 31, 2017. Rula and her family came to Madison just one week before President Donald Trump indefinitely halted all refugee immigration from Syria. "It's really frustrating because we are trying to do some important work. It makes me worry for the safety and security of the people we would've been settling here," Schwartz said. Schwartz said her agency in Madison has been "flooded" with offers of help for the new arrivals, including jobs, apartment furnishings and volunteer translators. "There has been an incredible outpouring of support from the public," she said. Yashar Tairov is the owner of Istanbul Market, the Middle Eastern grocery tucked into a small strip shopping center on Madison's west side where Rula and Abdul were shopping. Tairov said his relatives, who are of Turkish descent, emigrated from Russia to the United States in 2005. "They don't want to give me no job, no school, nothing," Tairov said, describing the discrimination his family faced as Turkish immigrants to the former Soviet Union. Tairov said the United States should welcome refugees, whom he has found to be hard-working and "happy to be in America." He pointed to Abdul, who eagerly pitched in, cutting a hefty beef roast into chunks that Tairov fed into a meat grinder. 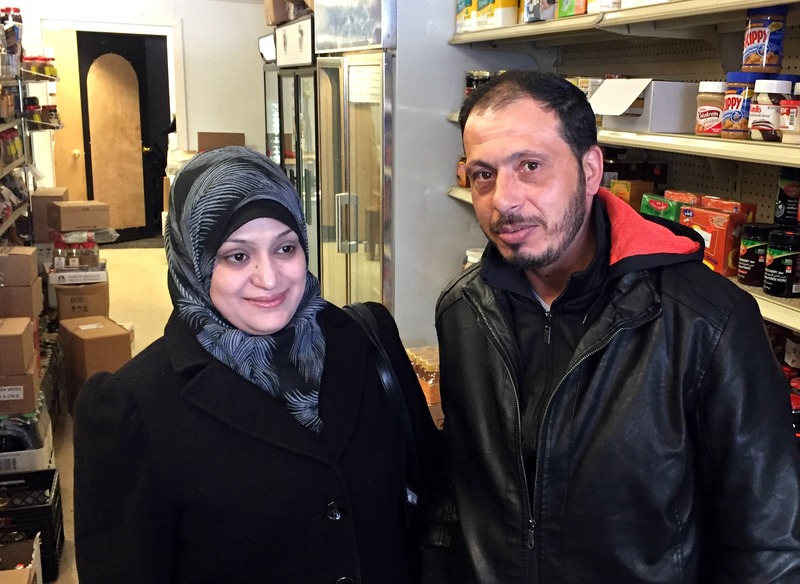 Rula said her husband has been unable to find steady work since the family left Syria. "I don't think refugees are something wrong or something bad," Tairov said. "These are not bad people, refugees. They're just hard-working people." Tairov's friend, Emin Buzhunashvili, stopped by to check on business. Buzhunashvili came to the United States in 1996 as a refugee from Azerbaijan. Buzhunashvili owns Mr. Delivery, a Madison business that delivers food from groceries and restaurants. He said it is the president’s duty to keep America safe. "I don't see anything he [Trump] is doing wrong," Buzhunashvili said. "He's not doing anything religious. What I understand is he's trying to clean the bad people from coming in." Asked about Trump's indefinite ban on Syrian refugees, Rula said it is "very painful" because there are "many others eager to come here for a better future, for a better education for their kids." "'Mom, is it true that Donald Trump's gonna kick all the Muslims outside the United States?'" Taha recounted, fighting back tears. "I don't want him to feel that he is not welcome here because he is Muslim or brown or African or based on any category. But I don't know, I hope things will get better because I live here, I have my friends here, I have my work here, my job, my home, my car. Come on, I mean, this is a free land." Taha said Rula also worries how her family's new life in America could be affected by shifting U.S. immigration policies. "I said to her, 'Do you think the new orders will affect your status or your benefits from being here?' and she said, 'I don't know, I don't want to think about it.'" Wisconsin Public Radio reporter Alexandra Hall contributed to this report. The nonprofit Wisconsin Center for Investigative Journalism collaborates with Wisconsin Public Radio, Wisconsin Public Television, other news media and the University of Wisconsin-Madison School of Journalism and Mass Communication. All works created, published, posted or disseminated by the Center do not necessarily reflect the views or opinions of UW-Madison or any of its affiliates.